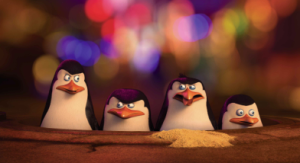 DreamWorks Animation recently moved up "The Penguins of Madagascar" from 2015 to a November 26, 2014 release. This is the first trailer they have released for this film, which is a spin-off from the "Madagascar" series of films. Many will say, "It's about time the penguins got their own movie!" The penguins have been fan favorites in the "Madagascar" films, just as Scratch usually gets people going in the "Ice Age" movies. But the real reason that a lot of people will go is because Benedict Cumberbatch is involved.There you go, I said it, and I'm not taking it back. Official trailer for 'Penguins of Madagascar' starring Benedict Cumberbatch, John Malkovich, Ken Jeong, Annet Mahendru and Peter Stormare. A spin-off from the Madagascar series centered on the fan-favorite penguins.